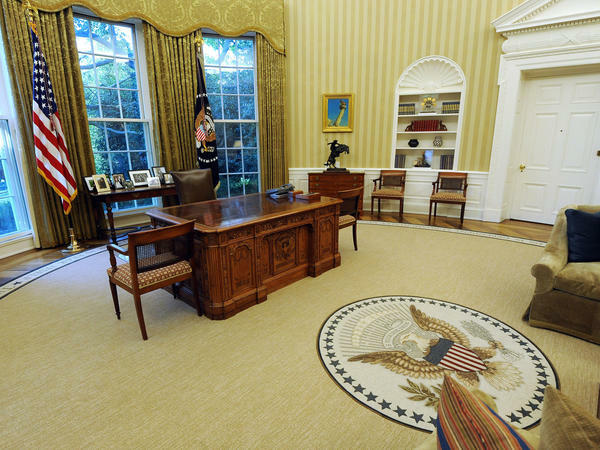 The first 100 days of the next presidency will look drastically different depending on who occupies the Oval Office. Trump also promised to withdraw from a proposed Asia-Pacific trade deal that's been in the works. Both those moves would be well within the new president's authority. "As a general matter, if the president wants to withdraw from a treaty, he simply gets to do that," said Benjamin Wittes, a senior fellow at the Brookings Institution. "That's part of the powers of the office." Trump would also have the power to deport more than 2 million criminals in the country illegally, halt immigration from parts of the world he calls "terror prone," and quickly reverse many of the initiatives undertaken by President Obama. "If you're an administration that lives by the executive order, than you're going to die by the executive order, too," said Stephen Moore, an economic adviser to Trump. He expects Trump would act almost immediately to reverse the power plant rules at the heart of Obama's climate agenda, as well as Obama's orders governing immigration enforcement and overtime pay. "You could literally have a stack of executive orders on Donald Trump's desk in the Oval Office that he could sign literally in his first hours of being president," Moore said. "And that would be in many cases, I think, an enormous lift to the economy." Other parts of Trump's agenda would require support from a friendly Republican Congress. Those include Trump's massive tax cut, the repeal of Obamacare, and that big new wall along the border with Mexico. "Don't worry about it," Trump assured supporters. "Mexico is paying for the wall. With the full understanding that Mexico will be reimbursing the United States for the full cost of such a wall." Hillary Clinton, meanwhile, has her own road map for the first 100 days if she winds up in the White House. "We're not going to build a giant wall," Clinton said. "We're going to build roads and bridges and tunnels and ports and airports and water systems and a new electric grid." Clinton told supporters in Johnstown, Pa., over the summer she will also pursue immigration reform and big new investments in clean power. "Within the first hundred days of our administration, we are going to break the gridlock in Washington and make the biggest investment in good-paying jobs since World War II," Clinton said. Most of Clinton's plans would require congressional support. And that would test the former secretary of state's negotiating skills, since the House of Representatives at a minimum is expected to remain in Republican hands. "She was a fairly successful legislator," recalled former Rep. Tom Davis, R-Va. "And her husband was just very good at working with a Republican Congress. She's got that in her background. But remember, the world has changed since that time." Washington, like the rest of the country, has grown more polarized. And either Clinton or Trump will face strong political headwinds from the very first day in office. "Remember this," Davis said. "The president, whoever it is, will come in with a high negative — probably close to 55 percent unfavorable view. That's not the traditional kind of mandate." Even if there's no traditional "honeymoon," though, whoever sits in the Oval Office will still wield considerable power, starting with the nomination of a new Supreme Court justice. Presidents generally try to deliver on campaign promises — and in many cases they succeed. So like them or not, voters should take these pledges seriously. "When somebody promises to do something, you have to think about whether that's something you'd be willing to see happen," said Wittes, the Brookings Institution scholar. "Because the powers are simply too vast and too dangerous to say, 'Well, he was probably clowning around at that point or he doesn't know what he's saying.' "
Now we're going to try to imagine what life will be like on January 21, 2017. The inaugural parade and the festivities are over, and the new president of the United States is ready for his or her first day of work. NPR's Scott Horsley reports on what we might expect from a President Trump or a President Clinton on that first day and the 99 days that follow. SCOTT HORSLEY, BYLINE: The new president's first full day in office will be a Saturday, so they could take it easy, sleep in. But that's not likely. After a seemingly endless campaign, both Donald Trump and Hillary Clinton are eager to get down to business. DONALD TRUMP: What follows is my 100-day action plan to make America great again. HORSLEY: Trump recently sketched out his ambitious blueprint with a speech in Gettysburg, Pa.
TRUMP: First, I will announce my intention to totally renegotiate NAFTA, one of the worst deals our country has ever made. HORSLEY: Trump also promises to withdraw from the Trans-Pacific trade deal that's been in the works. Benjamin Wittes of the Brookings Institution says both those moves would be well within the new president's authority. BENJAMIN WITTES: As a general matter, if the president wants to withdraw from a treaty, he simply gets to do that. And that's part of the powers of the office. HORSLEY: Trump would also have the power to make good on his pledge to deport more than 2 million immigrant criminals, to halt immigration from parts of the world he calls terror prone and to steer federal agencies in a sharply different direction than President Obama has. STEPHEN MOORE: You could literally have a stack of executive orders on Donald Trump's desk in the Oval Office that he could sign literally in his first hours of being president. HORSLEY: Campaign advisor Stephen Moore says Trump would act almost immediately to reverse the power plant rules at the heart of Obama's climate agenda, to undo orders limiting energy exploration and to cancel the reprieve from deportation that Obama granted to immigrants who were smuggled into the country as children. MOORE: If you're an administration that lives by the executive order, then you're going to die by the executive order, too. HORSLEY: Other parts of Trump's agenda would need support from a friendly Republican Congress. Those include his $6 trillion tax cut, the repeal of Obamacare and that big wall along the Southwest border with Mexico. TRUMP: Remember I said Mexico's paying for the wall - with the full understanding that the country of Mexico will be reimbursing the United States for the full cost of such a wall. HORSLEY: Hillary Clinton, meanwhile, has her own roadmap for the first hundred days if she winds up in the White House. HILLARY CLINTON: We're not going to build a giant wall. We're going to build roads and bridges and tunnels and ports and airports and water systems and a new electric grid. HORSLEY: Clinton told supporters in Johnstown, Pa., this summer she'll also pursue immigration reform and big new investments in clean energy. CLINTON: Within the first 100 days of our administration, we are going to break the gridlock in Washington and make the biggest investment in new good-paying jobs since World War II. HORSLEY: Most of Clinton's plans would require congressional support. And because the House - if not the Senate - is expected to remain in Republican hands, former GOP Congressman Tom Davis says that will test Clinton's negotiating skills. TOM DAVIS: She was a senator. She was a fairly successful legislator. And her husband was just very good at working with a Republican Congress. She's got that in her background, but the world has changed since that time. HORSLEY: Washington, like the rest of the country, has grown more polarized. And Davis warns either Clinton or Trump will face strong political headwinds from their very first day in office. DAVIS: Remember this, the president, whoever it is, will come in with a high negative, probably close to 55 percent unfavorable view. That's not the traditional kind of mandate. HORSLEY: Even if there's no traditional honeymoon, though, whoever sits in the Oval Office will still wield considerable power, from nominating Supreme Court justices to pulling the many levers of the federal bureaucracy. Presidents generally try to deliver on their campaign promises, and in many cases they succeed. So, for better or worse, Benjamin Wittes us of the Brookings Institution says voters should take these pledges seriously. WITTES: When somebody promises to do something, you have to think about whether that's something that you would be willing to see happen because the powers are simply too vast. HORSLEY: And this election will entrust those powers to one of these candidates for far more than 100 days. Scott Horsley, NPR News, the White House. Transcript provided by NPR, Copyright NPR. Texas has been a Republican stronghold in presidential races for the last 40 years. But Donald Trump has led Hillary Clinton by only single digit margins in recent polls. A look at why and what’s possible in Texas for Democrats in and after the November election. It may seem like Bernie Sanders and Donald Trump have nothing in common. Each candidate, though, has ideas that stray from his party’s platform. It’s been an exhausting election season, to say the least. Between three painstaking presidential debates, the ever-changing political hue of Texas (red, blue, purple, etc. ), and what we can only imagine extended relatives everywhere are saying on Facebook, many of us are running on fumes.